The day after the night before (the night being the one with all the severe storms and tornadoes) dawned bright and sunny. 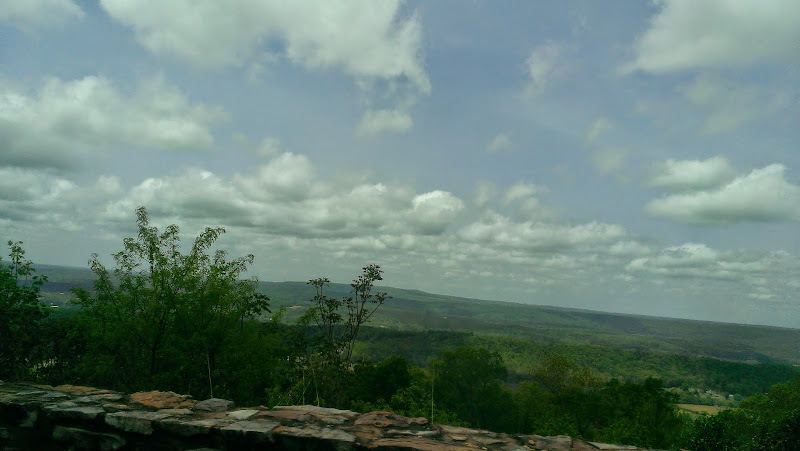 Knowing that our families most likely were worried about us, before even taking a shower we went to the lodge so we would have a network connection and I could call my brother to let him know we were okay. Interestingly there was a pay phone there – and it worked! 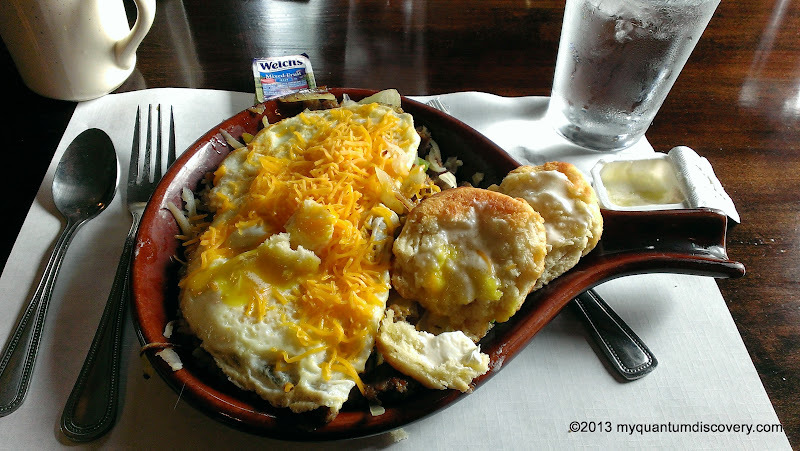 While at the lodge, we had breakfast in the Mountain Inn restaurant. We both had the Lodge Favorite Skillet ($6.75) which was two eggs cooked any way we wanted atop a combo of grilled sausage, onions and peppers blended with skillet hashbrowns and topped with cheddar cheese. Really good! As usual we had leftovers which we enjoyed the next morning. Despite being totally exhausted and with the threat for more potential storms later in the day (which the weather guy later termed a “dud” since thankfully the severe storms didn’t develop), we decided to spend a couple of hours exploring the area. 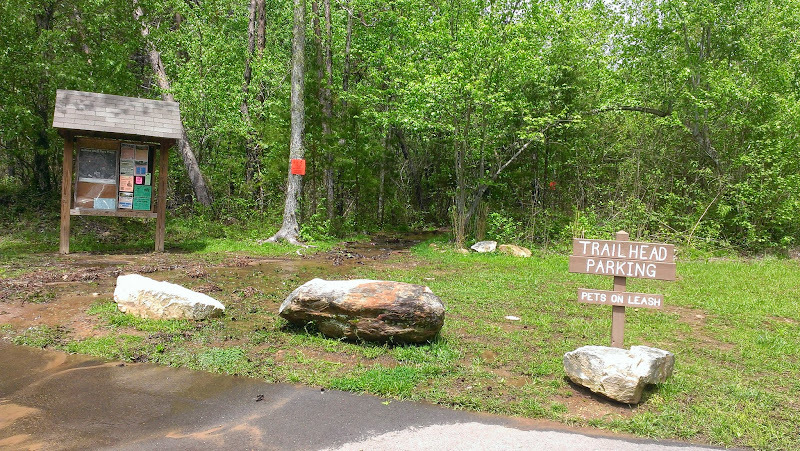 Nearby Lookout Mountain, along with Sand Mountain to the southwest, makes up a large portion of the southernmost end of the Cumberland Plateau in the Appalachian Mountains. Somehow we ended up driving along Lookout Mountain Parkway, passing by some beautiful homes located right on the top of the ridge. I certainly wouldn’t have wanted to be there in the midst of the havoc the night before but I guess they are used to it. 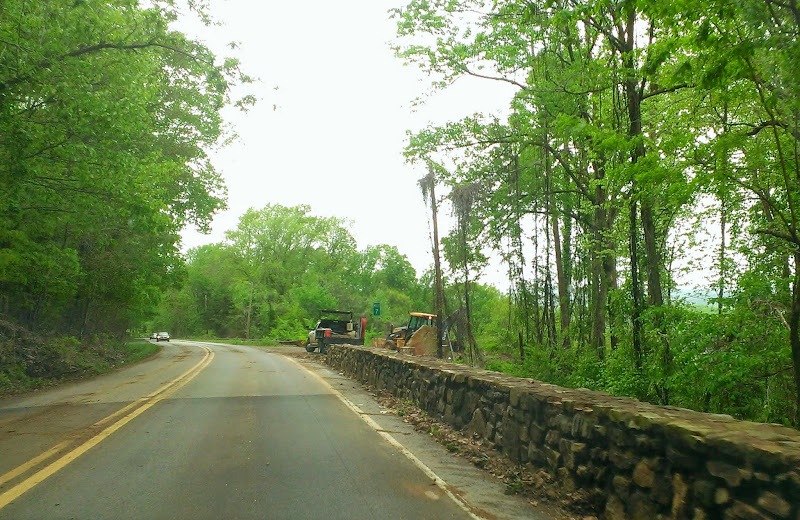 Except for an occasional fallen tree along the side of the road, lots of debris in the middle of the roadway and considerable erosion in the gullies bordering the pavement from the torrential rains, you wouldn’t know that severe weather had passed through here the night before. 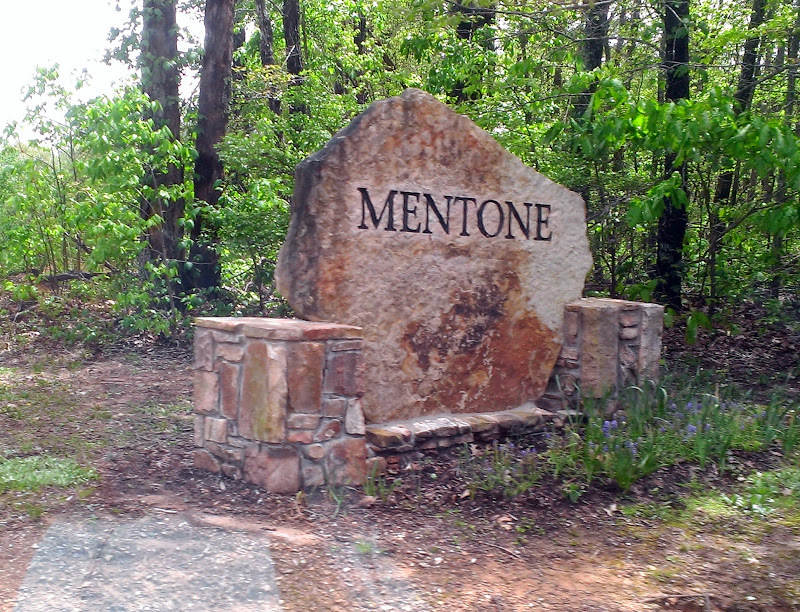 We passed through the small town of Mentone (pop. 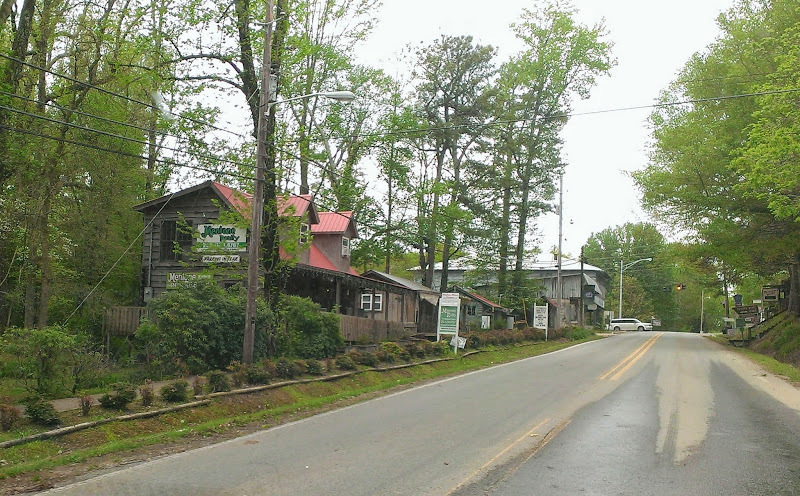 486 in 2009) which has the highest elevation of any incorporated town in Alabama. Well known as a center for arts and crafts and offering numerous shops and several restaurants, according to a blurb I read the population more than doubles in the summer. And during the winter it is famous for being the only place with snow skiing in Alabama at the Cloudmont Ski and Golf Resort. Looked like a cute and interesting place but we didn’t take the time to park and walk around. 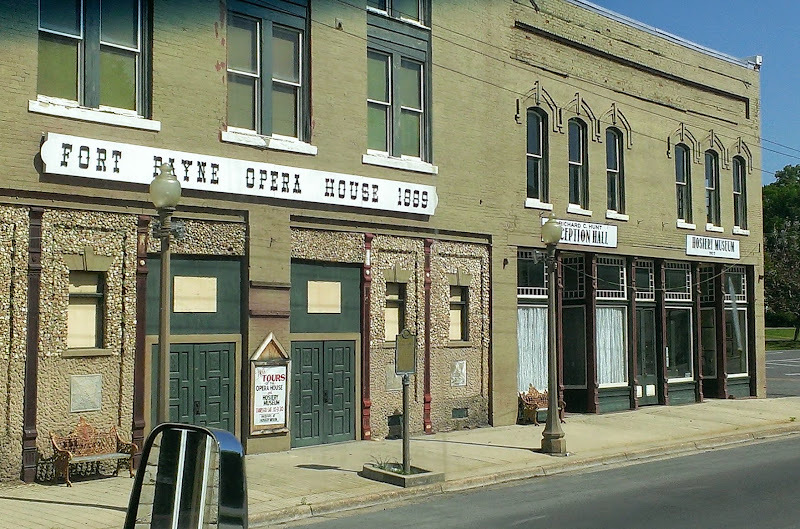 From there we headed into the town of Fort Payne which like many other places we have visited has a rich history. 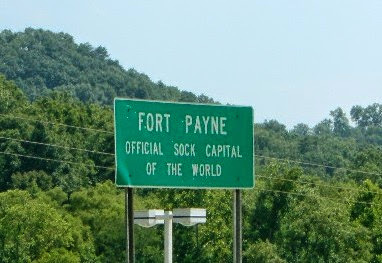 Located between Sand Mountain and Lookout Mountain, Fort Payne which is the county seat for DeKalb County, deems itself as the “sock capital of the world“. 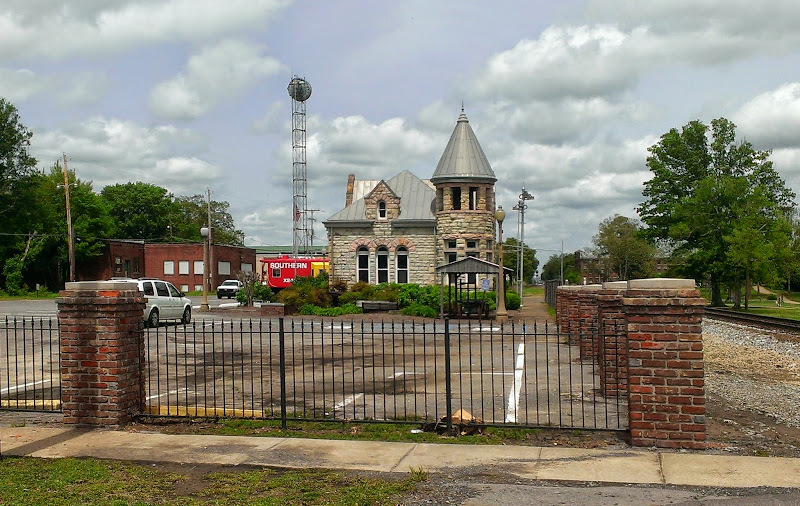 In the 1880’s, the discovery of iron and coal made Fort Payne into a boom town which lasted until the coal and iron became unprofitable causing the economy to collapse. In 1907, the Florence Knitting Company hosiery mill gave the economy a much needed boost. By the 1990s, the hosiery industry in the Fort Payne area produced more than 3 million dozen pairs of socks per week and employed some 5,000 people. Guess that’s the reason we saw so many signs for socks everywhere in town! There is also a hosiery museum in the center of town but I’m not sure if it is still open or not. In addition to the Hosiery Museum, there’s also the 1891 pink sandstone Depot Museum which has collections of local history artifacts, Native American artifacts and a railroad caboose. Once part of the Cherokee nation, Fort Payne was named after U.S. Army Captain John Payne, who in 1838 oversaw the construction of a stockade in Big Will’s (named for Cherokee leader, William “Big Will” Weber) Valley near Willstown. The stockade, which came to be called Fort Payne by the soldiers, was built to intern the Cherokee before their forced removal along the Trail of Tears to Indian Territory in Oklahoma. 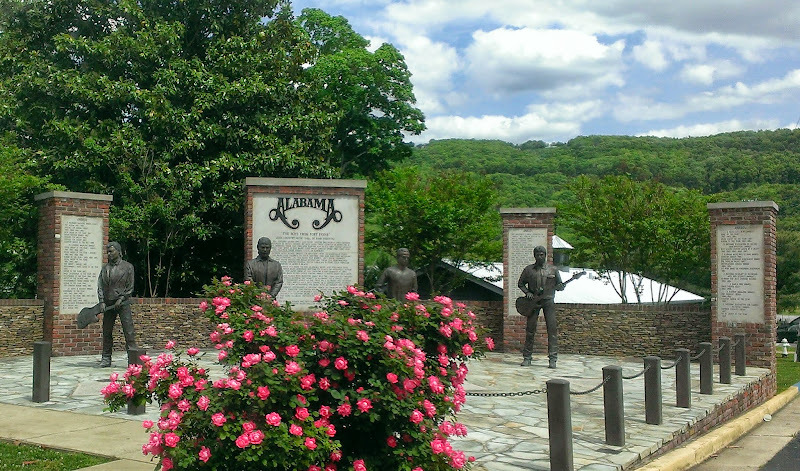 Another of Fort Payne’s claims to fame is that it is the home of the country music group Alabama who were at their peak of popularity in the ’80’s. 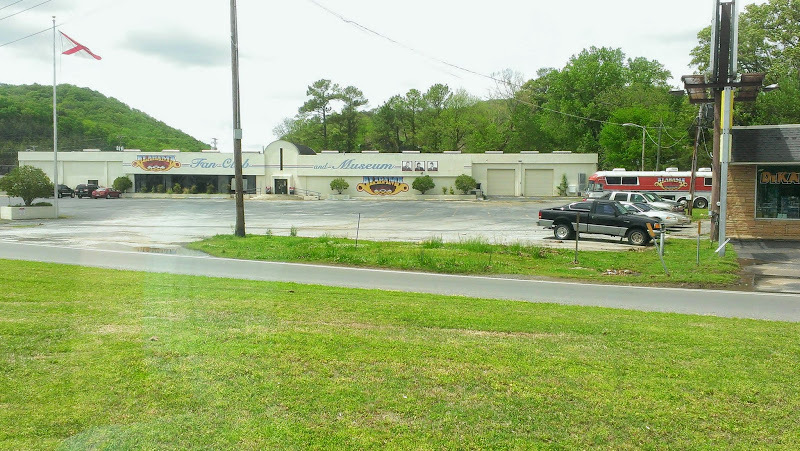 The Alabama Museum and Fan Club houses memorabilia from the group’s many awards and achievements. In the center of town there is a small park with statues of each member of the group. 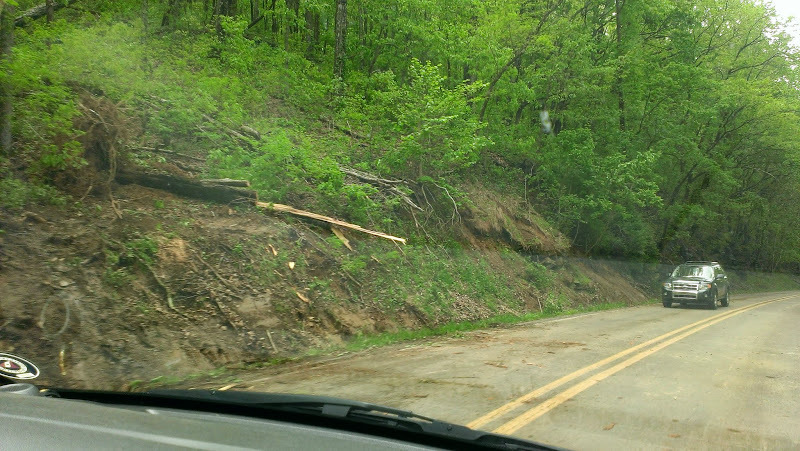 Although we had heard that there was some damage from an F3 tornado the night before, we didn’t see anything. It seemed like a perfectly normal day with typical weekday hustle and bustle! We finally decided that we should get back to the hacienda just in case the severe weather hit earlier than expected. 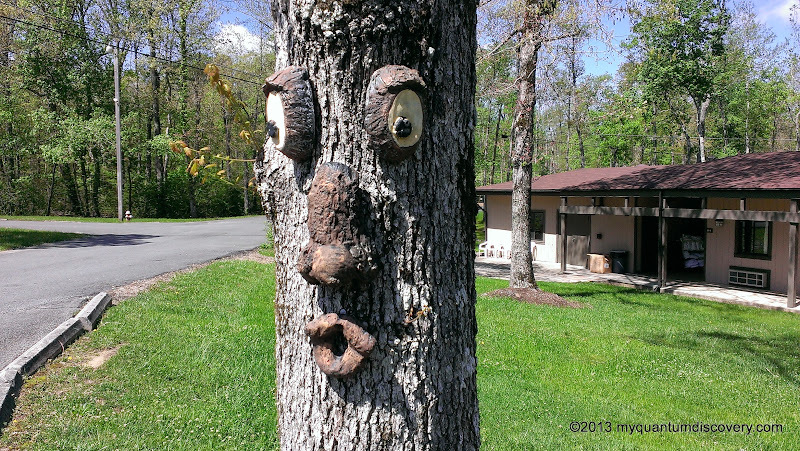 While sitting outside watching our outside TV (only the 2nd time we have used it) keeping an eye on the weather forecast, one of our neighbors, Barry, came over – he had a radio but no TV so he was interested in hearing the forecast. Later we met his wife, Cathy. Great, fun couple from Virginia! Even though we didn’t have much time to get to know them (they were leaving the next day), we thoroughly enjoyed meeting them and have kept in touch with them since then. Hopefully our paths will cross again someday! Luckily the storms never materialized so it ended up being a quiet evening. 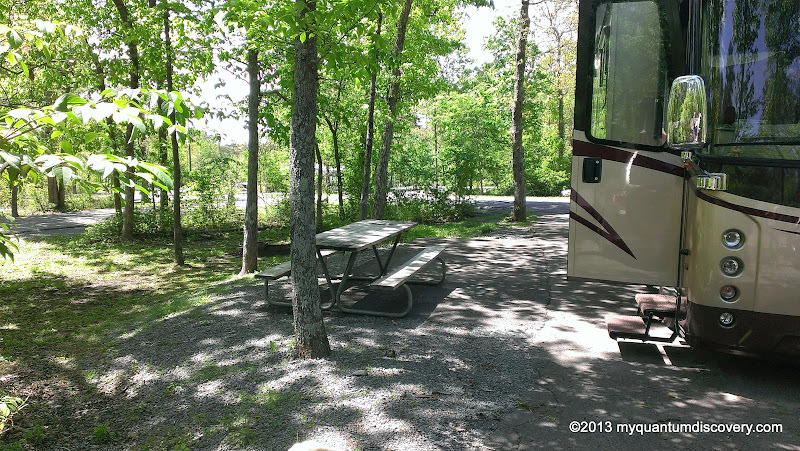 The next day the sun was shining and there were no threats of any severe storms so we went out exploring again! Stay tuned!